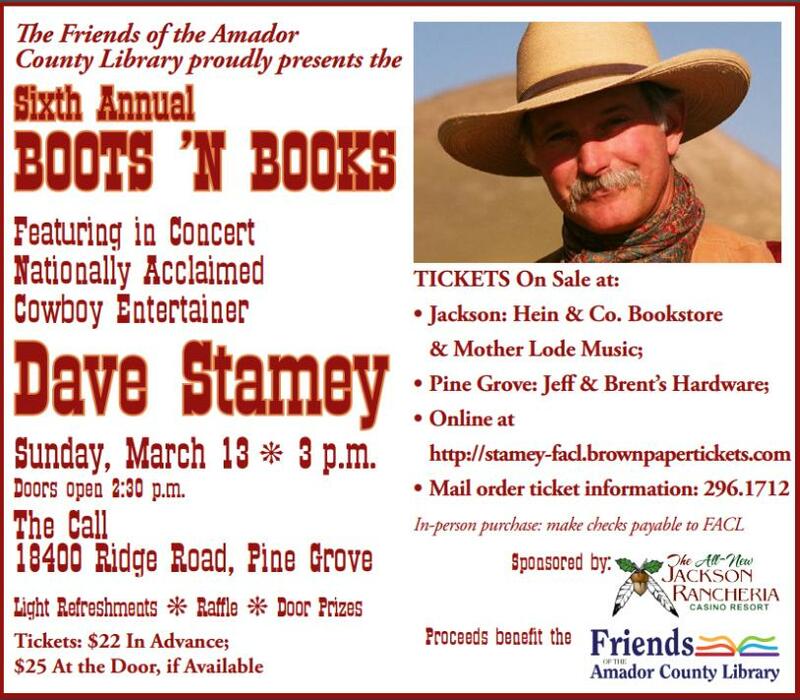 Dave Stamey, award-winning Western singer and songwriter, will bring his unique blend of cowboy poetics, humor and mellow-toned ballads to The Call Church, 18400 Ridge Road, Pine Grove on Sunday March 13, 2016 at 3:00 pm in support of the annual Friends of the Amador County Library fundraiser concert. Dave Stamey has sold out at past Friends’ fundraisers, so you won’t want to miss this show! The Western Music Association has voted Dave Stamey Entertainer of the Year six times, Male Performer of the Year six times and Songwriter of the Year five times. In 2010, 2011 and 2013 True West Magazine named him Best Living Western Solo Musician. He also received the Will Rogers Award from the Academy of Western Artists. Pre-registration Required. Click on button below to Register. Make a date for YOURSELF and join us in a relaxing, creative space. Bring a project you've been working on or start a new one. Need some ideas to get those creative juices flowing? This is the place to explore! Schedule a regular PLAY DATE for YOU! Basic supplies/tools provided. $15 gets you a spot! 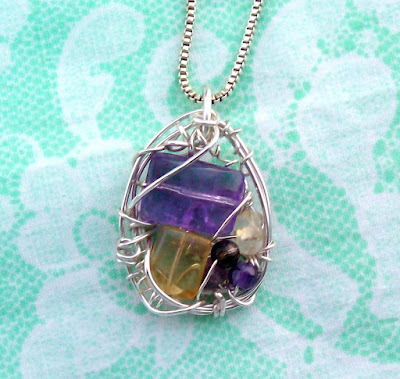 This is a fun class with no prior art experience needed! Gel printing is easy and you can use many tools for different effects . Suction printing can be added to the gel print surface or cutting and tearing it for use in collage. Want to show your art in galleries, art shows & fairs? You'll always learn something new from Jeannie whether it's your first class or you're a seasoned pro. Mary Nahhas, quilter & bag-maker extraordinaire, is creating gorgeous custom bags using my Goddess/Muse designs. Each one unique and well constructed, these totes are rich and eye-catching because of the materials Mary selects. Priced at $55 each tote has plenty of pockets on the inside and magnetic snaps for closure. They measure aprox. 18"L x 19"W x 6"deep and sit flat when set on the floor. Each one is embellished with crystals to add a touch of Goddess Bling! Thank you for supporting our local Art! The First Saturday of the monthly Amador Art Trek will be March 5. This is the fun, free self-guided tour that provides easy public access to where art is located, whether in galleries or businesses that hang unique art on their walls. Part of the Art Trek are the monthly “1st Saturdays” when some participating galleries have receptions in the afternoon to kick-off their new shows. Acme Art – Moke Hill “A Creative Playground” features watercolor artist, Deborah Marlene, on Sat., March 5th. Her colorful work captures in detail what makes our region so special. In time for Spring Break...KIDS CLASSES! Check out the calendar page at acmeartmokehill.com for details. And lastly - an April sneak peak - special guest artist, Anna Corba, is teaching artful journal making onSaturday, April 2nd. See her French inspired work at annacorbastudio.com. AmadorArts Gallery- Sutter Creek. For March: Paintings by Sharon Galligan, jewelry by Karen Crane, and photography of local scenes by Cynthia Dunn-Selph. Sharon, from Jackson, is well known for her lushly layered oil paintings inspired by local and worldly sites. 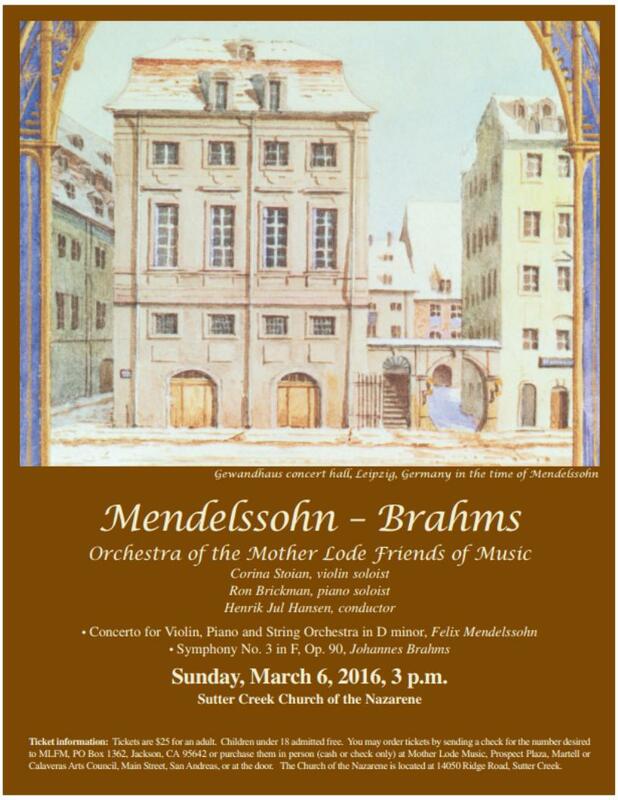 On March 5, gallery opens at 11 am, reception at 3-6 pm. Normal hours are Sats. and Suns. from 11 am to 4 pm. Call 209-267-9038 for weekday hours. Chaos Glass Works- Sutter Creek. Art Glass Gallery and Hot Shop: David and Heather Hopman make a wide variety of art glass items. Live glassblowing demonstrations happen all day on weekends. Fine Eye Gallery- Sutter Creek. From March 1- to April 15: “Assembly Required” Exhibit features Mixed Media Collages by Anne Cook and Mixed Media Lamps and Collages by Mark Taylor, both from Mokelumne Hill, and they both transform diverse objects into something new. Anne creates framed miniature worlds, and Mark crafts unique lamps with intricate stitched shades. Reception for the artists on Art Trek, 1st Sat., March 5, from 2-4 pm. Gallery 10- Sutter Creek. For March: Denise Gilroy’s plein air oil paintings, which embrace the beauty of the Sierra Nevada. A reception in her honor will be held on Saturday, March 5, 2-5 pm at the gallery. Her paintings will hang throughout the month. The gallery is open 11-5 Thursday-Monday during March. Little City Studio and Gallery- Amador City. Great new art work is featured to usher in Spring! And lots of jewelry, photo cards, accessories, and pottery, too. Come spot the delights at this colorful gallery featuring local artists. You might even find something developing on the owner's loom! Fri, Sat, Sun from 10 am to 5 pm. In the heart of Amador City. Petroglyphe Gallery- Mokelumne Hill. For March, Eileen Downes’ intricately-interesting wildflower collage works will hold center stage. Petroglyphe Gallery represents contemporary North American artists, many from California, who have impressive credentials working in oil, acrylic, watercolor, glass, ceramic and jewelry. Sutter Creek Gallery- Sutter Creek. For March, a member show entitled “Spring Ahead” will celebrate this theme. Expect images of rigging sails, spring birds and baby animals, flowering trees and poppies dotting the landscape. A reception will be held on Saturday, March 5, as part of Art Trek. Go by for refreshments between the hours of 4 and 7 p.m. while viewing the artwork and visiting with the artists. ​Addiltionally, these are the businesses on the Art Trek which also offer on their walls a glimpse of the art found in the region. Amador 360 Collective – Plymouth; Union Inn and Pub- Volcano; Sina’s Back Roads Café - Sutter Creek; Rosebud’s Café- Jackson. ; Uphill Vineyards Tasting Room- Amador City; and Valley View Interiors – Sutter Creek. To obtain the addresses and hours of all the locations listed above go to www.amadorarts.org and click on Art Trek. 1. 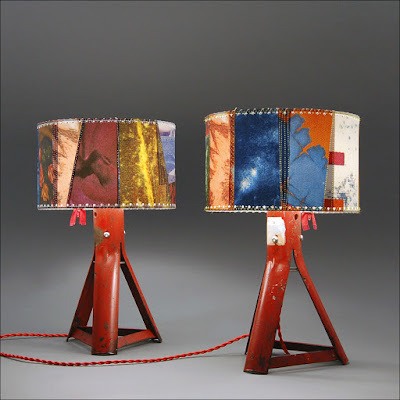 Fine Eye Gallery will be featuring the unique lamps of Mark Taylor. 2. Jim Glanton's work shows off the Spring theme at the Sutter Creek Gallery. 3. 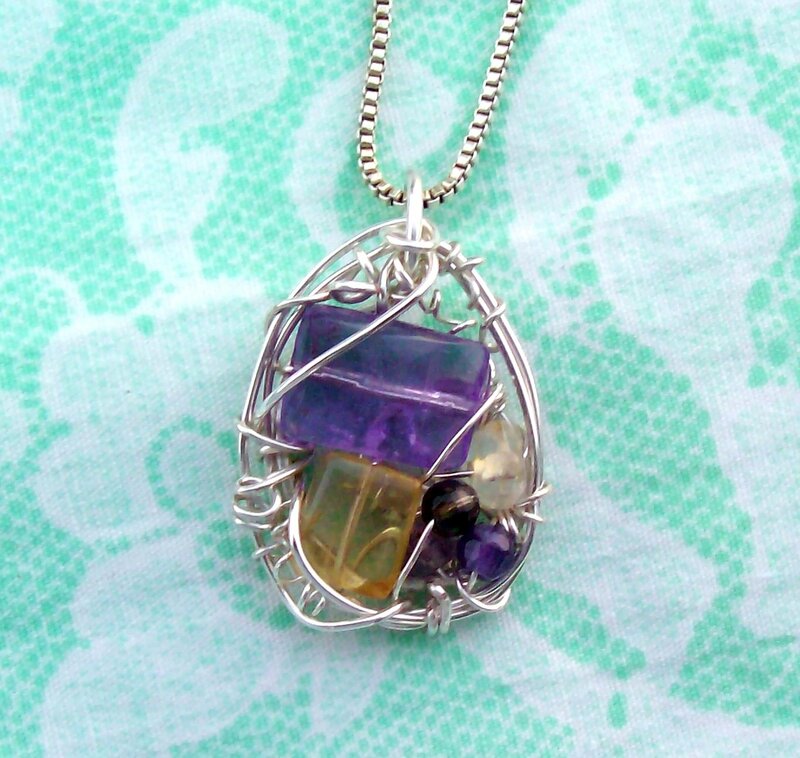 Pendant by Karen Crane is from her Spring collection available at the AmadorArts Gallery.